Ask fellow campers about "Mt. Greylock Campsite Park (formerly Hidden Valley Campground)" and nearby attractions. We stayed there three nights in late October to tour Mt Graylock and Berkshire sites. Owners are very friendly and doing a good job making improvements. The activity room is spacious and the fireplace made it very comfortable on the cool evenings watching World Series games on the big screen TV. WIFI was extra cost at campsites, but available free at office/activity room areas. No black water sewer dump at the sites but gray water could be dumped. Sites were spacious, heavily tree covered and the area is beautiful. We camped at Mt. Greylock Campsite Park (formerly Hidden Valley Campground) in a Motorhome. This was our first time at the campground and we really enjoyed our stay. We camped over the Columbus holiday weekend. We reserved a large back in site (50amp E/W/S) and were upgraded to a pull thru site so we were next to our daughters site. There were activities all weekend available to anyone who wanted to participate. They had Halloween trick or treating on Sunday as well as a haunted hayride later that night. The owners are really friendly and helpful. You can tell they really enjoy their jobs. Lots of improvements planned. The only thing we noticed is the roads could be a little wider, most places it was difficult for vehicles to pass each other. We will definitely be returning here. We camped at Mt. Greylock Campsite Park (formerly Hidden Valley Campground) in a Travel Trailer. It is apparent that the new owners have been making some recent upgrades, with more to come. We enjoyed our spacious site in the woods. The campground has a large variety of mostly wooded sites, some more private than others. Ours had some some recent utility work, and got quite muddy after it had rained for part of the weekend. The campground seems well maintained and cared for, the owners were super friendly a d helpful. Some larger rigs we saw coming in had a challenging time trying to back into some of the sites, there are some trees and rocks positioned in just the wrong places. Pool was nice (it has a deep end, not just a wading pool) and the rec hall had several free games, such as air hockey, pool, foosball, etc. Store sells mostly small snacks. I would like to rate the campground higher, but there is quite a hill between the sites and the pool and rec hall. The only main road is narrow and goes up and down this hill, not great for walkers or kids on bikes. Our site was between the safari field and the bathrooms, so we had several campers walking through our site- wished there was a dedicated walkway for those folks. Otherwise the owners were excellent, and I hope to return someday. Campground was very quiet at night, no road noise. We camped at Mt. Greylock Campsite Park (formerly Hidden Valley Campground) in a Travel Trailer. 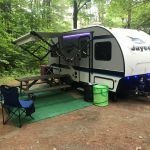 This campground is just minutes from Mt Greylock in the Berkshires. Drive (or hike) up Mt Greylock for beautiful views from the highest point in Massachusetts. The Berkshires have many wonderful things go to see and do: lots of art, hiking, paddling, shopping, and more, in a very quiet and rural setting. As others have said, new owner is working hard to improve this campground. He was very helpful backing us into our spot with large logs on one side which he will remove soon. Our site was large and quiet but we did have to level up 5 inches. Site was lumpy. No gravel or grass, but heavily wooded with lots of shade for hot days. Owner is improving sites everyday. Showers are being improved with new toilets just and plywood walls between two very large (free) showers and, old coin machine is still visible. Cleanliness problem is due to youth groups staying in this park. Pool is a gem and very clean. Did not check out laundry. Many seasonals, obvious by lots of decorations around sites but not obnoxious. Park is overall very quiet and beautiful. I will stay here again and look forward to up grading my rating in the future as I am sure this park will continue to improve. We camped at Mt. Greylock Campsite Park (formerly Hidden Valley Campground) in a Travel Trailer. Mt. Greylock, Old Forge restaurant nearby was excellent. Game room is fun for rainy days. The campground was recently purchased and the new owners are putting a lot of time and energy into fixing up this campground. 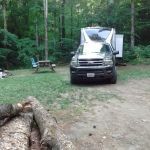 The owner was very helpful assisting me with backing our relatively small 20-foot camper into a tight spot, maneuvering around a few large boulders and between some trees. Once we were in, the spot was level and quite nice. Our breaker tripped the first night, just needed a reset and no issues after that. On your way to the campground, especially if you are coming from the North or the East, be careful when you ge to the town of Cheshire. If you GPS tries to send you toward West Mountain Road, don't take it! The road becomes nearly impassable with any size trailer including a popup. Stick to Route 8 South toward Pittsfield and then Route 7 North to the campground. Great location to see a beautiful part of Massachusetts. We were a little surprised that the new owners would open the campground for business in the midst of a lot of improvements. On the other hand, this is helping them identify what they need to focus on. We would certainly return. We camped at Mt. Greylock Campsite Park (formerly Hidden Valley Campground) in a Travel Trailer. Only about five minutes from Mt. Greylock summit. Worth the drive, pack a picnic lunch! Park is in dense forestland in the Berkshires. The location may explain higher pricing than otherwise for a hilly, potholed park with 50 amp electric, water and graywater-only sewers. Price paid reflects weekly rate. Charges vary with demand and are higher on weekends and holidays. Honey wagon visits are $25 but free if you stay more than a week. Daytime visitors are $6 a head; $12 for overnight. WiFi is available "throughout the campground" but you must pay to have it at your site, $5/day for a 3 mps connection for 2 devices. Using a satellite dish was impossible through the trees and cable is unavailable. Verizon was weak but streaming video, data and phone calls worked. The pool is heated and there is a playground. The camp is quiet (except for a Saturday DJ) and close to Berkshire attractions. Owner worked diligently helping campers. We camped at Mt. Greylock Campsite Park (formerly Hidden Valley Campground) in a Motorhome. Very good breakfast and lunch at nearby Bob's Country Kitchen, south on US 7. Tanglewood is about 10 miles away. If you plan to attend the Berkshire Craft Beer Festival, buy tickets online or days before the event; the $30 price goes to $40 on Festival day. The Lenox Rhubarb Festival was free, with $5 for a spoon to sample contest entries. Nearby Bob's Campers & RVs has a very competent mechanic. Park-sponsored activities include wagon rides for kids. This is a very nice campground, renamed Mt. 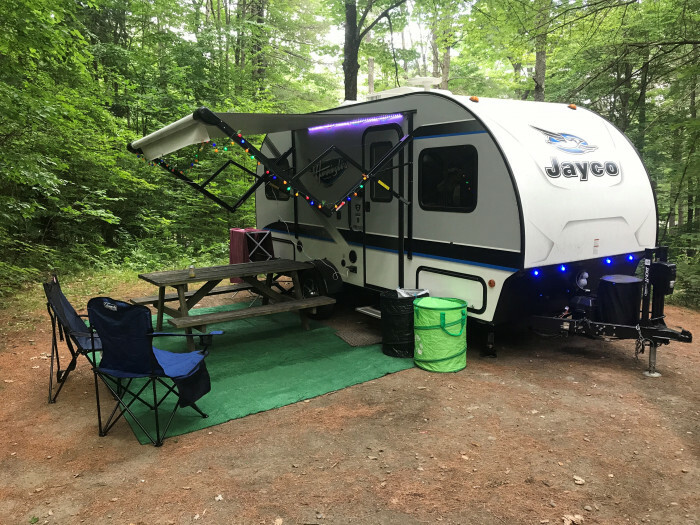 Greylock Campground, and has been under new ownership for about a year. The owners were very accomodating and willing to make sure we enjoyed our stay. The campsites are in a wooded area and are large and reasonably space out from one another. Our site was a large back in with electric, water and grey water disposal. Black water can be disposed of at a dump station or via a honey wagon. We were there for 4 nights and had a very enjoyable stay. We camped at Mt. Greylock Campsite Park (formerly Hidden Valley Campground) in a Travel Trailer. Tanglewood. Kayaking at Woods Pond. Very quiet, new owners, very nice large sites. We camped at Mt. Greylock Campsite Park (formerly Hidden Valley Campground) in a Fifth Wheel. Beautiful spaced out sites, many in the forest. Most sites are level. Unfortunately the bathrooms located by most of the sites, are in need of a major overhaul. Showers had problematic quarter operated timers, and leaked causing the concrete floor to become a giant puddle. We camped at Mt. Greylock Campsite Park (formerly Hidden Valley Campground) in a Motorhome. Great Bershire location. Right across from Mt. Graylock SRA. We stayed here for 4 nights over the 4th of July holiday. Our intention was to use the campground as a base camp due to the location in the Berkshires. Old campground, lots of old seasonal trailers in disrepair, outdated facilities, no kids’ activities and understaffed owners. Pros; sites were large, wooded and level. Electric was good and we ran our AC the entire time. Fire-pit was large but did not get a chance to use it. No sewer connection but there was a grey water dry well at each site. Pool water was clean. Verizon cell reception was good. Cost was reasonable at $32. Cons; main roads were washed out and had 3’ deep gullies where you could break an axle if you went into one of these, bathrooms were outdated but useable. Entrance road to campground was a single lane dirt road, very dangerous. No sewer at the site. Rec room was outdated by 20 year, no kids’ activities at all. Camp store only had a few items on the shelves. Pool area had weeds that were 4’ tall and maintenance of the pool area was poor. Mosquitoes were unbearable. Staff was rude and talked about insurance regulations the entire time but yet they had a 20’ bonfire and roads that could swallow up a camper, go figure. We camped at Mt. Greylock Campsite Park (formerly Hidden Valley Campground) in a Travel Trailer. Spent the holiday weekend with large group and was a wonderful experience. The staff were very friendly as were the seasonal campers. Fishing pond and rec hall great for the boys. Could use a little more planned activities for the kids. Pool was not open in time for the holiday. Will absolutely consider coming back again! We camped at Mt. Greylock Campsite Park (formerly Hidden Valley Campground) in a Travel Trailer. As mentioned earlier, this is a rustic campground, which is fine with us. However, the sites are laid out very oddly, which compresses the pass between sites. A little work on the sites are leveling purposes would get this a higher rating from me. We camped at Mt. Greylock Campsite Park (formerly Hidden Valley Campground) in a Motorhome. We loved it here. Exactly our kind of rustic camp. However if you insist on concrete pads, paved roads, no trees, and 43 foot class A's, you might not like it. I got our 38 foot Winny in just fine, so I guess a sense of adventure is required. This is the kind of place I miss when staying in a KOA like parking lot. Hosts were wonderful. We camped at Mt. Greylock Campsite Park (formerly Hidden Valley Campground) in a Motorhome. This is a privately owned campground that is at the base of Mt. Greylock. The owners are friendly and accommodating. If you have any questions or problems they are there to help you. The road leading to most sites is up a hill and unpaved. The seasonal sites are nicely spaced and are appealing to the eye. The tent sites are also nicely spaced. There are two bathroom facilities with showers. The one that was near us had only two showers and I can visualize a waiting line during busy times. Our plan was to go to Tanglewood during our visit. Tanglewood is a 30 minute (+ or -) drive depending on traffic. We were there during a slow week and hope to go again before the summer is over. We camped at Mt. Greylock Campsite Park (formerly Hidden Valley Campground) in a Travel Trailer. Are you affiliated with Mt. Greylock Campsite Park (formerly Hidden Valley Campground) ?